Computer programming requires some very intricate work. This is the type of work that thrives on details and people who work in this field understand that the absence of even the minute elements can spell a huge difference in the overall result. If a programmer fails to correct this problem, it can lead to errors down the line. As a result, bugs will appear in the system and errors will emerge later on. Programming is also taxing work, requiring hours upon hours of writing, testing and debugging. This is why computer programming thrives on team work. Without team work, a single computer program can take decades to complete. Although one programmer has the necessary skills and knowledge to work competently on a problem or even create a program, he or she can only do so much. Creating the source code for an operating system, for example, will require thousands of man-hours from a single programmer and most probably, he or she will only be halfway through. There just isn’t enough time for one or even two programmers to work effectively to produce a usable program. So what constitutes a team in computer programming? A team is usually headed by the team leader, such as a systems analyst or senior programmer. The senior programmer is usually a person who has had years of training and experience behind him. His task is to supervise the team, lead in brainstorming and problem solving sessions, delegate assignments, check the correctness of the coding, dispense advice and recommendations and lead in debugging and software maintenance. The team leader is the one who holds the team together and ensures there is a well coordinated effort that will lead to the desired results. All team members report to him and depending on the size of the project, the team leader may have an assistant or another leader to work with. 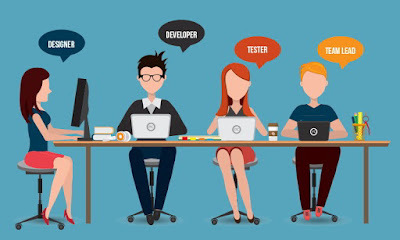 The team is usually composed of junior or entry level programmers, particularly those who may have the qualifications but not the number of years' worth of experience yet. Depending on what the team leader wants, a junior programmer may be tasked to work on his own on much simpler assignments or he may be assigned as part of a group. This group may consist of other entry level programmers or more experienced professionals. The members of a team are chosen based on their expertise. At the beginning of a project, the team leader, along with other more senior programmers, will try to break down the problem into components, which will consist of tasks. Tasks can vary according to complexity and function and will be assigned to a team who has the skills to complete them. The number of programmers in a team can be as small as 3 or it can number in the dozens or even hundreds. Again, it all depends on the size of the project and the availability of resources. Team work is a necessary component of computer programming. It helps pool a group's resources and form a coordinated effort in order to produce a particular program or software. In some cases, such as in exceptionally huge projects, some teams may work alternately or in shifts, which makes it necessary that a team is capable of sustaining coordination among them. Team work drives computer programming. A vast majority of the computer programs and software we enjoy today – from the operating systems to the video games to the technology that run our phones – were produced not by a single programmer but by a team. Whatever it is that has made using computers and other forms of technology that much easier and more convenient is something we owe to a team of well-trained and highly skilled computer programmers.